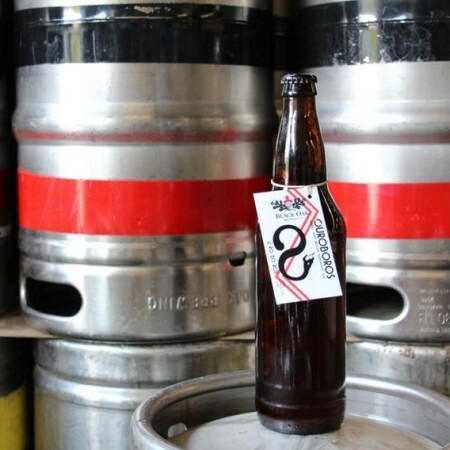 TORONTO, ON – Black Oak Brewing has announced the return of a limited edition beer that was previously available a year ago. The Ouroboros, represented by a snake eating its own tail, is an ancient symbol of the infinite and cyclical nature of life, death, and rebirth. This is a fitting emblem for our aged saison, which is given new life in Ontario-sourced oak Baco Noir barrels year after year. On the nose, the orange peel and coriander are still present, adding a hint of spice to the red currant tartness and vanilla flavours picked up in the barrel, finishing with clove, bubblegum, and banana. Ouroboros is available now exclusively in the Black Oak retail store for $9.95 per 650 ml bottle while supplies last.